Bibliography: The image above is from The Complete Poems of Anna Akhmatova: Expanded Edition, translated by Judith Hemschemeyer, edited by Roberta Reeder (Zephyr Press, 1992), page 770. The poem below originally appeared in Akhmatova's book White Flock (Petrograd, 1917). 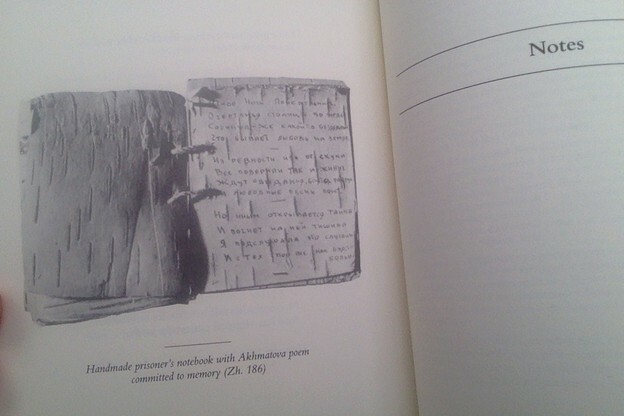 Comment: Noam and Batya were over, and I was showing them the photograph above [caption: "Handmade prisoner's notebook with Akhmatova poem committed to memory (Zh. 186)"]. We accorded this poem a great deal of authority, given it was copied out of somebody's head, in the gulag. We were dying to know what in the world the poem was saying. Noam and I had some Russian, and we were ecstatic to find we could more or less understand the first line. There was some fuss, finding the piece in that huge book, but when we did find it we were quite satisfied. See below. It remains to be said that the literal version at the bottom of this post is my own. It's not just a dictionary translation, though. It's the translation I kept "spontaneously" reproducing, when I would force people to listen to me reciting the Russian. I thought I was merely repeating the Judith Hemschemeyer translation verbatim, but when I wrote my version out and actually checked it against Hemschemeyer, I found my thing followed Akhmatova's rhythm more. One other thing. I am posting this precisely today because today is the only "Monday the 21st" that falls during my tenure as a guest curator for Jacket2. The poem is ninety-nine years old. Akhmatova was around twenty-eight when she wrote it. Что бывает любовь на земле. И с тех пор все как будто больна. Chto bïvaet lyubov' na zemle. I pochiet na nikh tishina . . . I s tekh por vso kak budto bol'na. The outlines of the capital are in mist. That love exists on the earth. And singing little love songs . . .
And a hush will fall over them all. And since then—I've been a little bit sick. All through January, February, and March of 2016, I'll be posting more or less exotic items here, every Monday and Thursday. That comes to twenty-six exhibits, so I'm labeling them 'A' through 'Z'. Almost all this material is foreign or old or (mostly) both. I'm hoping to expose readers of Jacket2 to stimulating things they've never seen before. ¶ For years I told my students every literary person ought to accumulate (over the course of, say, twenty years) his or her own Palgrave's Golden Treasury. I wanted people to actually keep detailed lists and, if possible, privately print the relevant materials "for subscribers only." Imagine reading Anne Carson's Golden Treasury. Or Guy Davenport's. Anyhow I mention this because all of the items I'll be posting are from my Golden Treasury. ¶ Every posting will begin with a bibliography. This is for the benefit of the bookhounds out there, who might like to order the original, beautiful, first-edition, smoke-smelling, water-damaged hardcovers, online. Also I'll throw down a few brief observations about the poems, if I have any. ¶ Let me stress: Satisfaction is guaranteed. If, for whatever reason, your expectations are not met, simply return unused portion for a full refund. ANTHONY MADRID lives in Chicago. His poems have appeared in Best American Poetry 2013, Boston Review, Fence, Harvard Review, Lana Turner, LIT, and Poetry. His first book is called I Am Your Slave Now Do What I Say (Canarium Books, 2012).